Card: 6 The Queen of Owls – from The Heart of Faerie Oracle by Brian and Wendy Froud. “This is the bright queen of physical healing. When the physical body is unbalanced or in pain, it can be difficult to find a connection to anything other than that pain or disease. Relationships can falter and fail when all of your attention pivots on dealing with pain. When your physical body becomes the only thing you can focus on, turn to this bright and gentle being. She radiates wholeness and wellness and can help you find the inner strength you need to come through disease into healing and health again. The pain is real, the disease is real, but the power to heal is real within you as well. 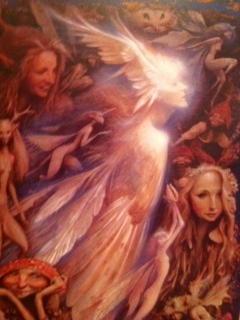 Concentrate on her image and reconnect with the healing energies of Faerie”. Message from the Faeries: The faeries that you see in this card are all of full of the light that you see shining through the Queen of Owls. This light also shines through you. Sometimes you forget that this light exists inside of you. We know that you guys live in a dualistic reality where sometimes you choose to get sick or you experience some sort of disease. It’s part of the dualistc nature of reality that you are here on Earth to experience. Without sickness, you would not know health. There are lots of people who are feeling quite ill these days. It’s the winter and most of you have slowed down with the rhythm of this season. Your bodies have also slowed down and have become more susceptible to illness. Your coworkers and family members are probably also laying low and some of them might be sick. It’s just that time of year. Let your bodies enjoy the slow motion of the winter. Enjoy a little bit of hibernation. Most importantly, please take good care of yourselves. This is a time of rest and a time to fill your bodies with warm nourishing food. It’s the time of year where naps shouldn’t be a luxury! When you have decided that you no longer wish to feel sick and would like to be healed you can ask us, The Faeries, to assist you and we can pour an infinite source of healing light into your whole being and help to heal you. We will always be there for you. But, please, we feel it is very important for you to understand that you have access to this infinite healing light at any given moment. It exists inside of you. In fact, YOU are the infinite source of healing light and energy! We know it is hard to really understand and come to terms with this, so we are more than happy to do that job for you, but we also feel it’s important that you have a deep wisdom, like an owl, of your true nature. The choice to heal or not is always yours to make, and whatever you decide to do for yourselves we support whole-heartedly. You are perfection, guaranteed! Many healing blessings to all of you. Love, The Faeries.